Options are set up and managed through the app's dashboard. Follow the step-by-step instructions below to learn how to create options for your products. 1. Starting from your Infinite Options dashboard under the Custom Option Sets section, click on the New Option Set button. An Option Set is a group of custom options that you can assign to specific products on your store. Note: Infinite Options will sync your entire product catalogue while on the dashboard, to which it will display Catalogue Sync Complete when the process is completed. 2. You can click on and edit the Option Set 1 text to name this Option Set, which is helpful for organization. 3. Start off by creating the Label, which will be the text that will appear above the option field on the storefront product page. It will act as a title for your option. Clicking on the blue arrow or Label will display the option's configuration menu as well. 4. The next step is to set the Field Name for your option. This will be the text that appears at the cart summary screen, checkout, and the order details page showing what the customer selected for this option. For example, in the image below of a Shopify store's Cart Summary screen, Name, Notes, Age, etc. are all examples of the Field Name. You will want to make sure that your field names are all unique values to prevent any confusion from yourself or your customers. 5. Next, select an Input Type for the option. You can choose from a Text, Large Text, Number, Radio Button, Checkbox, or Drop-down Menu option type. Each will have their own series of configurations - click here to learn more about any configuration settings for the input types. There's also a preview of how the option field will display, with the Label displaying right above the drop-down menu. 6. After completing the option's configurations, you can head back to the light-blue section near the top of the Option Set.Specify the products you'd like the options to display on by defining a logic rule. Click here to learn more about assigning your options to your products. 7. 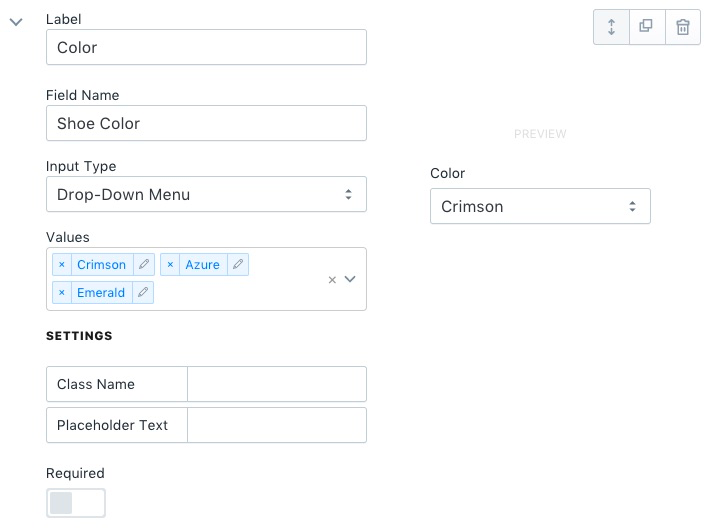 You can create as many custom option fields within your Option Set by clicking on the Add Another Custom Field button. Note: Options may take a few minutes to display on your storefront once you've saved your changes. If your options are still not displaying on products after a few minutes, you may need to follow the installation process explained in this article.